Booked for a different hotel but in the middle of small village so transferred to this hotel. I have stayed in Santa Ponsa before and this location was great, not right in the centre, but not a long walk. Rooms were clean and cleaned daily. Pool and pool bar were great. Service was really good and friendly. Booking again for this year. Entertainment was really good and hotel reps catered for young and old. Best holiday I have had for years and I have paid for some 5 start hotels but this could beat them. The hotel is is a nice location. less than ten minutes to the beach and the main town. that is the only good thing about it. I asked to be moved the morning after arrival due to the volume of noise. Walls are paper thin,you can hear people snoring. Doors slamming shut at 4 and 5am. Management signs on every floor to say that noise will not be tolerated after 12am. Such a shame they do not follow through on their policy as the bouganvilla would be a nice play to stay if they did.The night staff need to be more vigilant. My two weeks was ruined by unruly guests, fighting,screaming, arguing,slamming doors. Luckily in my 2nd week a nice couple moved in on one side and a mother daughter on the other. I stayed around the pool one morning only, that was enough. Not much space,packed with children.I would go to the beach every morning,towels were spread on every sunbed early morning with nobody lying on them.again something the management declare not to put up with but did nothing about in my eyes. I would never stay at the Bouganvilla again.Yes the reception staff are friendly.Asked for a kettle for my room 3 times,never got it.Rooms very clean.If you want to get some sleep early evening or after mid-night then forget about staying here. I had to stay out late in order to try and get some sleep. such a shame as the hotel has so much potential. We stayed at these apartments in July they were very clean and spacious - had to ask for iron & kettle & fan etc at reception charge a rental fee minimal though. Air conditioning not worth talking about though, fan much better. Bathroom very spacious and actually had a bath great for soaking in cold water with bad sunburn. Pool very busy but very good clean and actually has a deep pool and shallow kids one. The only problem is the distance from the beach and main strip about 15 to twenty mins depending on energy better off closer to town. It wasn’t noisy at all at night very relaxed hotel and spotless clean in all areas. The hotel its self was great. The pool was fantastic and always seemed to be enough sun loungers for everyone. The food was a little repetative but of good quality. The walls are a bit thin but i was obviously lucky with my neighbours as there wasn't much noise. The entertainers worked really hard and there was something for everyone most nights. Excellent, would recommend it to anyone! I was not impressed at all with these apartments, we were a young couple, and these apartments is totally for families with small children, the entertainment for kids was brilliant but does not cater for adults at all. We only ate at the poolside bar twice and i have to said i found it very expensive, ther dew drop across the road is real good food n reasonable. the walls in the hotel r paper thin i mean u can hear every movement, n if u want a lie in in the moring n ur neighbours dont then sorry but any movement next door n u will be wakened. I also have to say during my stay in these aparments (1wk) i saw approx 10 lizzards. 1 of which was inside the apartment. From the apartments to the beach / resort centre it is approx a good 15min walk, or 4 euros in a taxi. it is not a central hotel at all. nightlife in santa ponsa is good, a few good bars n clubs. I can not fault the resort itself, i really had a brilliant time, i was just dissapointed by the location and the type of apartment. Without a doubt these were the worst apartments we have ever stayed in. The rooms were filthy and although the cleaners came to the rooms I don't think they actually did anything. The rooms were tiny, we had adjoining studios but the adjoining door had no lock. The bathroom door in one room was faulty and I got locked in on the first night. The shower in the other room did not work at first but it was repaired when we complained. The reception staff were not the friendliest but the bar staff were lovely. Entertainment was hopeless unless you had toddlers. Food and drinks at the bar was very expensive especially compared to The Square. The location wasn't great as it was a good distance from the beach. We booked thinking that Bouganvilla was a 4 star apartment with air con. To give it 2 stars would be generous and the air con was noisy and didn't cool the rooms down at all, we would have been better with a couple of fans. 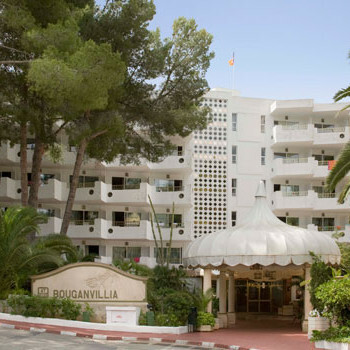 Travelled to Majorca and stayed in the Bourganvilla apartments in May 19/5/06. Travelled with partner and 7 year old daughter. Nice apartments very small not ideal if you want to cook meals as the apartments are to small. We had a pool view so it was nice. Very clean walls are very thin so if you want to stay in bed during the day forget it more suitable for families. Entertainment apartment not great except for the parrot show one night. Pool very nice no shortage of sun loungers pool does not open until 10. Food generally good nice pizza place out the back gate across the road made in Italy. Staff were very friendly especially the girl at reception.